Behavioral effects of fusaric acid, a specific inhibitor of dopaminebeta-hydroxylase (DBH), were evaluated under double-blind conditions in manic patients. Inhibition of DBH selectively decreases central norepinephrine (NE) without a decrease in dopamine and thus provides a test of the NE hypothesis of mania. Fusaric acid administration was associated with a significant decrease in cerebrospinal fluid 3-methoxy-4-hydroxy-phenylglycol (the major metabolite of NE) and an increase in homovanillic acid (the major metabolite of dopamine), changes consistent with central DBH inhibition. Behavioral effects of fusaric acid appeared to depend on the preexisting clinical state. 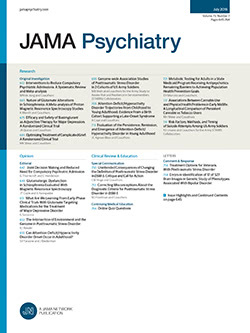 Patients with more severe mania, including evidence of preexisting psychotic features, became consistently worse (more psychotic), while patients with mild hypomanic symptoms showed no change or slight improvement. Conventional antimanic therapies, initiated after the fusaric acid protocol, were associated with improvement in the expected time period in all patients.